The musical group aims to invoke environmental and political change through grassroots sustainability. It’s quite possible that the Nile is the most important body of water in human history. Running for a total of 6,853 kilometers, its water has served as the lifeblood for many of humanity’s earliest civilizations. However, the Nile is also a source of conflict, as 11 different nations all struggle to assert their ownership of the river. On top of all this lies the ever-present calamity of climate change, which only serves to warp the river’s ecology and exacerbate an already tenuous situation. The mission statement of the Nile Project—which visited Wesleyan to perform in Crowell Concert Hall last Friday, April 10—is to invoke environmental and political change by evoking grassroots sustainability. In some ways this is rather ironic, as the experience of watching the group perform feels less centered around the Nile as an ecological body and more focused on the astounding range of culture that has grown along its banks. The Nile Project, as a musical collective, brings together musicians from every country through which the river passes, each a master of a culturally distinct instrument. When the show began, the 12 performers took to the stage, one at a time, each dressed in clothing of both personal and cultural significance, bearing their unique instruments, contributing to the whole of the composition. As the musicians began to play, the collective wove its way through a vast array of musical sensibilities and traditions. Even without any knowledge of world music, the sheer diversity and scope of the compositions felt sprawling, immediate, and arresting. The opening piece had a deep and hearty sound to it, based much more around energy and rhythm than the notes themselves. Even when more contemporary instruments such as the saxophone and bass guitar entered the mix, they felt complementary to the powerful undergirding of the drums in tandem with the inanga and oud. Even though the song was rooted in patterns of progression, every musician got a chance to move up front to demonstrate the power of their individual instrument, often while dancing along with the rhythm of the other collective members. 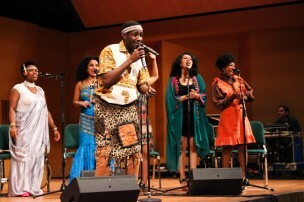 In contrast, the second song had a more melodic focus, with harmonized vocals singing in Swahili, accompanied by a flute and saxophone playing in tandem, to create a single unified sound. As the next few songs progressed, all of which seemed centered more on African musical traditions, it was fascinating to notice trace elements of what we often consider distinctly “western” music. A combination of saxophone and vocals echoed contemporary soul; the strumming of the oud rang of American folk. There was even a moment where the rapid lone strumming of a kora (a type of miniature harp) sounded like an electric guitar solo. It was astounding to be made keenly aware of how much modern music owes to the diversity and innovation of these genres. As the show progressed, the focus of the music continued to shift, moving like the water of the Nile itself. Songs incorporated building Middle Eastern influences, aided by the slow and powerful singing of Dina El Wedidi, who dexterously wielded the rhythms of Arabic. If there’s one negative thing to be said about the show, it’s that Crowell Concert Hall felt like a poor choice of venue. It makes sense in a lot of ways, given the space’s capacity: There were hardly any empty seats in the hall, which, for a show that charged $6 for students and $25 for the general public, says something about the demand. Yet, Crowell feels like a venue meant for sitting and contemplating the music at hand and this concept often seemed at odds with the Nile Project’s music, which felt like an energetic celebration of life in all its forms. Early in the show, vocalist Sarah Mohamed Abunama Elgadi ’04 (her stage name is Alsarah) told the audience to feel free to enjoy the music in whatever way felt natural. However, it wasn’t until the band actively encouraged the audience members during the last two songs that people finally streamed into the front corners of the hall in order to dance along with the musicians. Looking back on the night, I realized that much of my time as an audience member was spent trying to categorize specific cultural features. I think the most magical element of the whole show, however, is that there came a point where I consciously decided to stop doing that. All of these compositions showed a collaboration of so many different backgrounds. This was most strongly exemplified when Alsarah and Wedidi passed the microphone back and forth, singing in Swahili and Arabic respectively. Ultimately, I realized that the best way to approach the group’s music is by accepting it as belonging to a whole new region altogether. The Nile Project seems to believe in a philosophy of viewing nationality in terms of culture and ecology, rather than defined borders. Within this view, it chooses to see all the countries of the Nile region as unified through their mutual dependence on the same waters of life.